The crazy shiz going on in North Korea isn’t getting enough play. Basically, every player on the team was individually called out for their specific shortcomings. 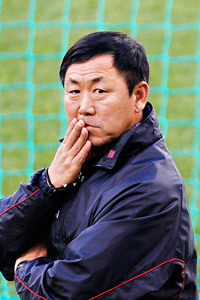 Each player was then forced to denounce the team’s coach, Kim Jong Hun. Apparently this entire process took six hours – six hours. “The embarrassing performance at the World Cup is seen as a betrayal of Kim Jong Un, son of despot Kim Jong Il and his likely successor,” writes reporter Bobby Melok. Now, these are the same coach and “Supreme Leader” that were communicating via an invisible cell phone not too long ago, right? And Kim Jong Il is still claiming he invented hamburgers, right? If you ask me, this kind of man is more dangerous than any country with nuclear weapons. There’s absolutely NO telling what he is capable of. At least Osama bin Laden keeps us informed via VHS recordings. I think Americans could take something away from this whole scene, though. Imagine what we could have done to the 2004 U.S. Olympic basketball team. Easy Fix = Send Alan Iverson there to join the “Workers Party” – and the whole place will fall apart.